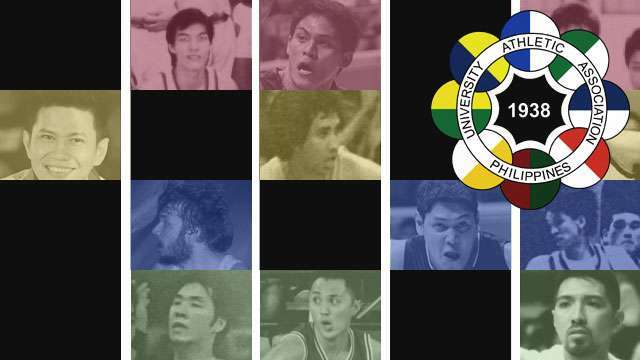 With the upcoming UAAP season ready to bust out of its shell, Team FHM attempts to defy all logic and create an all-time, all-generation fantasy starting five for each participating university. All arguments against our choices, verbal abuse, and the inevitable eyebrow-raising are very much welcome. Do know these lineups weren't plucked out of thin air; we have a criteria to help us pick these truly stella and select rosters. 1. Roster composition based on current NBA All Star selection: two guards and three frontcourt players, or vice-versa. Times have changed, baby. 2. Diversification: As much as possible, we try to avoid including too many players from one generation. 3. Legend Status: Because the magic matters. Whatever your titos told you, and whether or not they’re half as true as they say, are every bit as important as what you witnessed on TV. 4. NCAA Continuity: Some teams have shared history split across NCAA and UAAP eras; we included both for continuity purposes. 5. No Imports: We know what you’re thinking: Ben Mbala is a human cheat code and will inevitably plow through this list guns blazing. We decided against including imports to challenge ourselves more. 6. Extremes: We decided to exclude players who played before the '60s, as well as the ones still playing in Season 80 due to lack of statistics and further information. Don’t smite us, Moro Lorenzo. 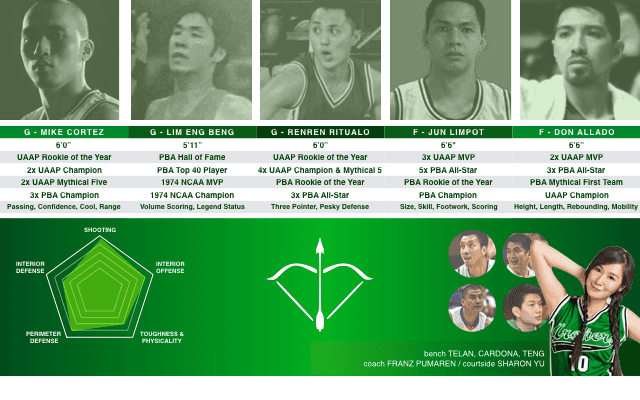 DLSU has been an incredible factory of individual talent for decades, and the amount of star power collected over the years has been staggering. Building a dream team proved to be difficult due to the sheer number of names that had to be left off the list. Cool Cat Cortez’s pinpoint passing and assassin-like demeanor should serve as catalyst to a blazing pace-and-space offense anchored by multi-MVP wings Lim Eng Beng and Renren Ritualo. We’re hoping Lim Eng Beng, the blueprint of what would be an incredible line of La Salle in-your-face scorers, can replicate his 32 ppg season and unleash at least one 55-point explosion like he did in 1974, while sniper Ritualo could stretch the floor and frustrate his opponents with momentum-killing threes. While this backcourt might possibly be this list’s craftiest and most potent (and most infuriating to play against), it isn’t physically equipped to excel at defense, even with its trademark full court press as insurance. This is why Don Allado and Jun Limpot need to pick up the slack and instill nightmares on anyone wishing for an easy layup, as well as add a dash of post-ups and offensive rebounds while they’re at it. Allado can even connect on classic plays from partner-in-crime Ritualo. Akin to James Harden’s Houston Rockets, this team is purposely built to outshoot, outpace, and outscore opponents despite inconsistent defense, and they will no doubt be excellent doing so—but here’s hoping this roster doesn’t run out of gas for 40 full minutes. 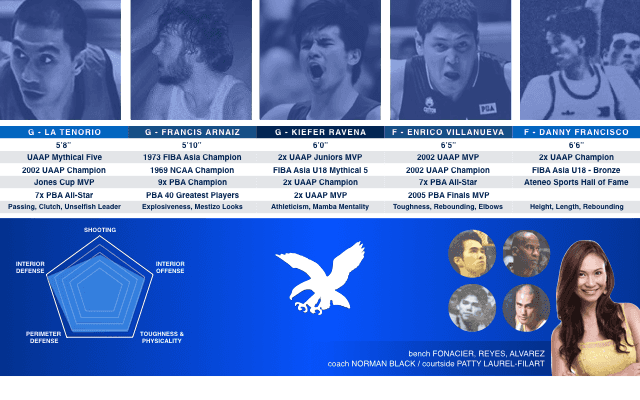 Contrary to other UAAP squads, Ateneo’s individual standouts have been relatively scarce, especially in the long-term; but Ateneo offsets this by developing a more defense- and team-oriented philosophy built on solid playmaking, sound fundamentals, and finding the perfect role players for the job. Ateneo has traditionally been #blessed with quality point guards. No disrespect to All-timers Olsen Racela and Jun Reyes, but a prime and PBA-ready L.A. Tenorio was probably the most complete modern point guard in the country. Tenorio could run the competition dry with his clutch shooting, chronic unselfishness, and slick pick and roll mastery—a skill he should wholeheartedly abuse together with the exceptionally athletic slasher and finisher Kiefer Ravena. Ravena does surprisingly well in the rebounding and interior scoring department, something he was quite excellent with in an off-ball role while sharing the floor with Nico Salva and Greg Slaughter; which is why he is our bold pick at wing. Nine-time PBA Champion and Toyota fan favorite Francis Arnaiz would provide additional scoring punch, trademark explosiveness, and a signature smile for the fangirls. We speculate that if Danny Francisco’s career wasn’t cut short by a heart ailment, he could have easily been one of Ateneo’s great centers. He started over Jun Limpot in their national youth days and was on the same level of conversation with U.P. legend Benjie Paras in college. He recorded a 25-rebound game against DLSU. If we can just stretch our imagination a bit more, Francisco could potentially form a formidable tandem with the wider, more physically imposing Enrico Villanueva, who should immediately dismiss talks on this roster being too ‘soft’ and ‘refined’. Villanueva’s physicality and penchant for pain should immediately complement Francisco’s skill and finesse beneath the basket. This is a grit-and-grind power team that should rely on relentless defense, a clinical pick-and-roll, and timely hustle plays to edge out the competition. The immense population and community behind UST has given rise to a diverse collection of superstars from all positions, and has proven to be one of the most fun rosters to craft overall. This roster can flat-out score anywhere, anytime, anyhow. While these players aren’t the most athletic (with the exception of Cyrus Baguio), they are certainly offensively gifted in a variety of ways. Jervy Cruz had always been undersized in the PBA, but in a more offensive-minded roster, the highly skilled and versatile Cruz can be this team's version of legendary Boston Celtic Kevin McHale. Dennis Espino would anchor the paint as Robert Parish, and lightning-in-a-bottle Bal David would blitz defenses as Dennis Johnson. Top 40 PBA great and multiple PBA scoring champion Bogs Adornado would take the isolation scoring duties as Larry Bird once did. When we get to Baguio, however, our analogy fails spectacularly. Imagine Kobe freaking Bryant joining the Celtics. Baguio’s high-flying antics and otherworldly dribble penetration could unlock the defense and allow the other four players to patiently unleash their slow, but efficient half-court offense. One simply cannot associate greatness and U.P. without mentioning the immortal 1986 squad of upstarts led by iconic guards and future coaches Ronnie Magsanoc and Eric Altamirano. This is why we are breaking our own rules and picking three from this squad to be the foundation for U.P.’s dream team. No offense to the incredible backcourt talents of Marvin Cruz, Toti Almeda, and Jett Manuel, but we could look no further than the duo with the best championship pedigree. Altamirano and Magsanoc needed a key to unlock their team’s full potential, and that came in the shape of towering PBA icon Venancio 'Benjie' Paras, who could very well be U.P.’s most dominant player ever. Despite being known for his comedic antics, Paras was all business in his duel with Jerry Codinera for the 1986 UAAP championships. Altamirano, who was the less-heralded of U.P.’s backcourt, proved his doubters wrong by scoring a clutch 27 points in the decisive contest, leading to an elusive MVP award. Magsanoc, of course, went on to have a magnificent career in the PBA. 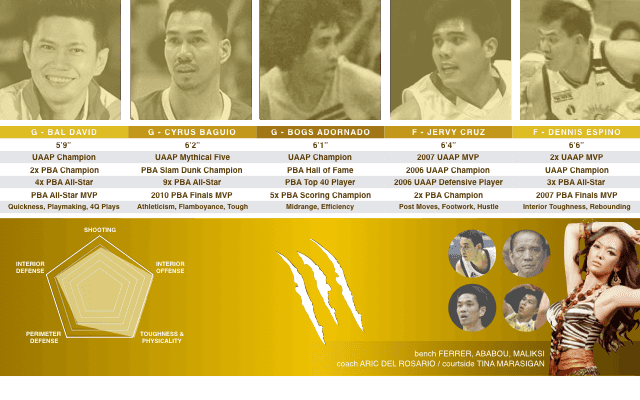 We had to pick the rest of the team based on PBA merits, as U.P. didn’t exactly have a treasure trove of elite basketball players. 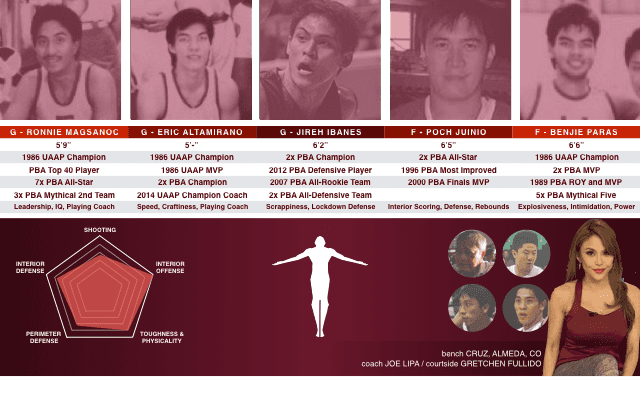 The feisty Jireh Ibanes, once PBA’s Defensive Player of the Year, could act as a lockdown defender for opposing hotshot guards, and provide a few gutsy shots a la Bruce Bowen. Poch Juinio, who has a PBA Finals MVP under his name, could man the paint alongside Paras and shut down point blank attempts. Armed with the brain trust of Team Sana Maulit Muli and more PBA-proven talent, this roster might just achieve the impossible and instill fear in both the UAAP and NCAA today.